It finally happened. After a few months of hovering over the policy pause button, the Federal Reserve officially halted interest rate hikes. For the first time in 10 quarters, no measure to further tighten monetary policy was announced. 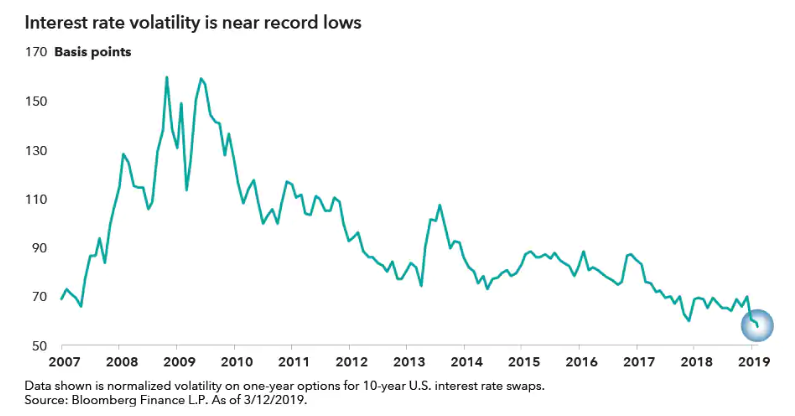 Significant equity volatility at the end of 2018 and more modest inflation have prompted the Fed’s recalibration. Holding the federal funds target rate range to 2.25%–2.50% reflects this new perspective. The Fed also indicated greater pragmatism around its effort to shrink its balance sheet: It will begin to taper its asset reduction in May and cease its unwind entirely by the end of September. Crucially, the Fed’s estimate of future rate hikes — the closely watched “dot plot” — has changed to indicate zero rate hikes for 2019, down from the two estimated in December’s projections. This was in line with market expectations. So far, markets seem to have had a positive initial reaction to the announcement. But what does the Fed’s recalibration mean for investors over the longer term? Three Capital Group portfolio managers offer their perspectives. The U.S. central bank’s decision to hold steady on rates underscores how much its policy stance has shifted. Since the market volatility of late 2018, the Fed has struck a more cautious tone. In late January, its monetary policy committee inserted the word “patient” into their statement. It also indicated a likely end to quantitative tightening — its effort to shrink the size of the assets on its balance sheet — later this year. 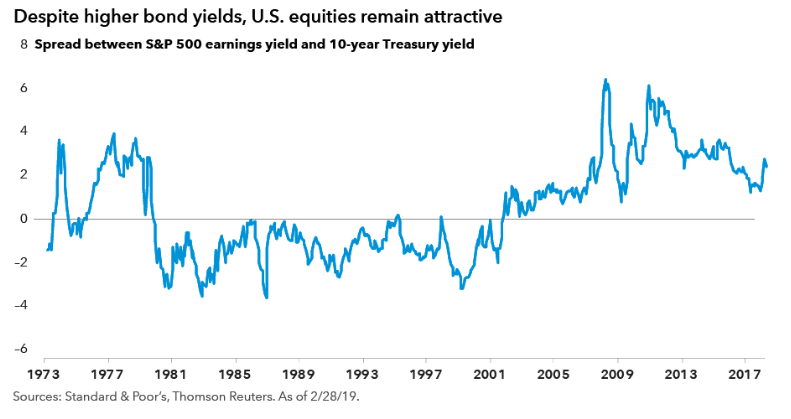 Markets lapped up the news: Since late January, yields have fallen, equities have rallied and credit spreads – a measure of the premium that investors demand to take credit risk – have tightened. In line with this, interest rate volatility implied by options markets has fallen to all-time lows. 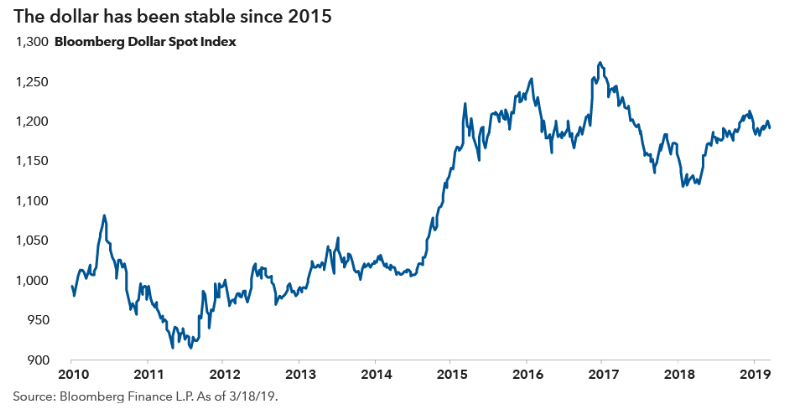 Our interest rates team view is that while the change in tack by the Fed has been the primary catalyst for financial market performance year-to-date, the Fed can only control so much. Interest rates can, and will, move with changes in the economy. For example, if inflation picks up, a rising interest rate environment will result regardless of the Fed policy stance. If global or domestic growth slows, interest rates are likely to fall substantially. While we think that the probabilities of these outcomes are fairly priced into outright bond yield levels, we believe that volatility (options) markets are underpricing the likelihood of sharper interest rate moves. Overall, the Fed has clearly contributed to the calm we’ve seen in markets so far this year. But political and economic outcomes are still quite uncertain, and investors should not be lulled into a state of complacency. U.S. equities remain attractive over the long term, in my view. There is still room for the market to go up, particularly now that the Federal Reserve has taken a more dovish stance. The decade-long U.S. economic expansion also could continue for a period of time, despite the fact that we are clearly in the later stages of the cycle. Either way, we should expect to see more volatility ahead as investors grapple with relatively high valuations, global trade tensions, upcoming elections and slowing economic growth in Europe and China. In such an uncertain environment, if the U.S. economy begins to show signs of weakness, I want to be prepared for it. In portfolios where income and capital preservation are primary objectives, I am seeking downside protection. For me, that often means companies with low debt levels, steady cash flows and sustainable dividends. I don’t necessarily need a high dividend, but rather one that is unlikely to be cut, even in a recessionary period. That is a key component for downside protection. Certain sectors are fertile ground for these types of companies. The utilities sector is a good place to start. Companies such as American Electric Power, with long-term contracts and a stable rate base, tend to hold up relatively well in troubled economic times. Discount retailers such as Costco also can offer some solid, defensive characteristics. As always, company-by-company, fundamental research is required to identify these opportunities. That kind of deep research is even more essential during an economic downturn, when a formerly rising tide is no longer lifting all boats. Markets have already largely priced in the impact of a Fed pause to emerging markets asset valuations. The Fed’s more cautious stance, therefore, is unlikely to be an incremental positive for markets going forward. Only if we see something new — like stronger economic activity, an easing in trade or geopolitical tensions, or a significant weakening of the dollar — do I expect emerging markets to feel additional external support for their already strong growth rates based on relatively solid fundamentals. Domestic economic policies and sovereign credit fundamentals are likely to be a more important determinant of returns than Fed policy over the medium term. That said, we are in markedly different territory compared to previous Fed hiking cycles. In the past, U.S. monetary policy often had a major impact on emerging markets. Many developing economies were reliant on financing from developed markets. So, when rates went up, so did their financing costs, which created an obstacle for business activity. Today‘s emerging markets are less reliant on external capital markets and have more diverse sources of funding. In particular, their local markets are more developed and often provide a substantial share of their financing needs. Stay up to date with the latest news from Capital Group by hitting the 'follow' button below and you'll be notified every time I post a wire. Want to learn more about Capital Group? Hit the 'contact' button to get in touch with us. Investors will figure out that there's no escape from quantitative easing, see EU and Japan, which implies continuous QE to target 1 to 2% inflation. And when they factor this in, they will ask, why hold treasuries yielding zero percent or negative interest? It would seem inevitable that investors will then sell paper and exchange it for hard assets including equities, infrastructure, real estate and precious metals.